Ugh. Moving, right? Packing, coordinating, updating contacts and everything that goes along with it is time consuming in itself. Managing to squeeze it all in when you have a full-time job or kids to take care of? Sometimes it seems impossible! The trick is to plan ahead and reframe your thinking. 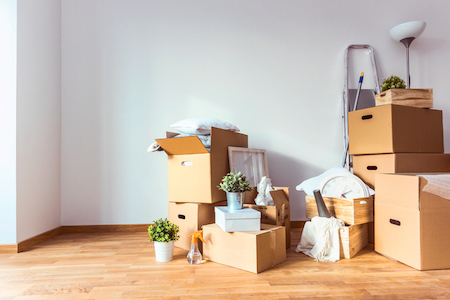 Here are some of our best tips for making a move as fun and stress-free as possible. Sure, you could hire a guy with a truck off Craigslist and laugh to yourself about how much money you’re saving on movers. But the last thing you need to worry about is being caught in a moving scam, having your items damaged or dealing with someone who doesn’t prioritize timeliness on a day when time really is of the essence. Make the experience smoother by hiring a professional company. This doesn’t have to be the most expensive company you can find, but you should feel totally confident that they’ll be on time, value your patronage and have a system that includes walk-throughs, checklists and extra packing measures for your fragile or awkward items. As soon as you have a move-out day confirmed, begin packing. It’s one of those tasks that sneaks up on you, so starting early can really be a stress-reliever. The closer you are to your move-out day, the more you’ll have to coordinate as it is! To make things easier, start with out-of-season items, such as holiday decorations or camping gear, and things that are easy to pack, like clothing and textiles you know you won’t need for a little while. Make it a rule to do a little bit each day and this will really take a load off as the date gets closer. This works really well if you’re moving with kids in tow, but let’s face it, it’s a fun option for people of any age. Think of the entire moving process as a process with tasks, and an amazing end goal—your new home! Make a map or list of things you need to do, like update your address, obtain your keys, pack and clean. Not only does this give you a sense of accomplishment after completing each task, but it’s far easier to manage when you break a big process like this down into steps. With any luck, you’ll be at the finish line soon, where you can enjoy the results of your labour in your brand-new space!